Training at the Woodbury Y has become a family affair for three generations of the May family. Maritt May was the trendsetter for her family and started with weekly Pilates Reformer sessions in 2010. Working with personal trainer Stacy Otto, Maritt focused on strength training using TRX, Kettle Bells and free weights. Together, they also worked on running, and Maritt was able to cut significant time off her 5K races, and went on to complete several more races, including a 10K, 10 mile, and half marathon. After seeing the benefits his wife was experiencing, Nick May started training in 2011 to help prevent sciatic nerve pain. To keep things fun, Nick does buddy yoga and Pilates Reformer sessions with Maritt to strengthen and stretch his back. Nick and Maritt’s children—Grace and Michael—also love working out at the Y. In sixth and fourth grades, Grace and Michael like using the row machines, elliptical trainers, BOSU Balls, and the track. In the summer the whole family comes in for Bootcamp. With encouragement from Nick, his mom Kathy started training at the Y in 2011. Although she has some limitations with her shoulders and knees, Kathy enjoys working on the Pilates Reformer, recumbent elliptical and taking water aerobics classes. And thanks to Kathy’s suggestion, her husband George got in on action in 2013. George works on core and overall body strength at the Y and has improved his golf game as a result. 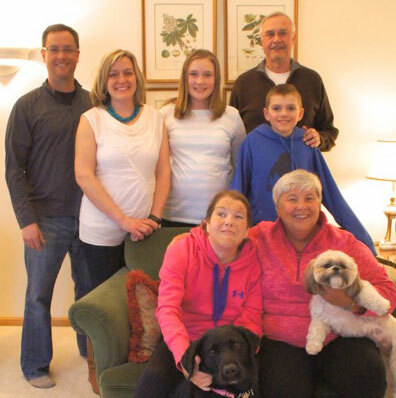 Nick’s sister Sarah and her guide dog, Christine are the most recent May family members to join the Y in 2013. Even with eyesight limitations, Sarah completes full-body workouts including walking laps with Christine, and using the elliptical and strength machines. The May family is a great example that personal training can meet you wherever you are—no matter your age or ability level!